Baby yogurt. It’s one of the first foods I remember giving my older daughter (who, incidentally, turns 5 today!). She gobbled it up and that made me feel that as a new mom, I was doing something right. The brand I purchased by the six-pack was Stonyfield Farm’s YoBaby and five years later, it’s the same name that I’m feeding my 1-year-old. YoBaby organic yogurt’s texture is creamy and it goes down easy–a big plus for finicky eaters. And if your little one is teething like mine is, this yogurt is refreshing on sore gums and nutritious to boot. The line has just been enhanced with the addition of more zinc (for boosting immune systems) and vitamin D (for better growth support). If you haven’t yet tried YoBaby, now is the time. 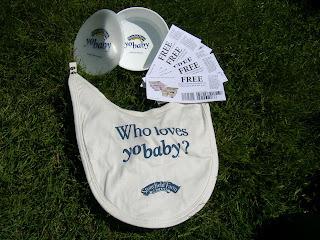 If you e-mail me at pambrill@talkingwalnut.com, you can enter to receive five free YoBaby coupons, a YoBaby bowl with lid and a YoBaby bib (pictured here). Bon appetit! In a Nutshell: Portable nutrition is something all busy moms can appreciate. Give your baby her daily calcium and other essential vitamins whether she’s dining on the go or at home. Just don’t forget the spoon!